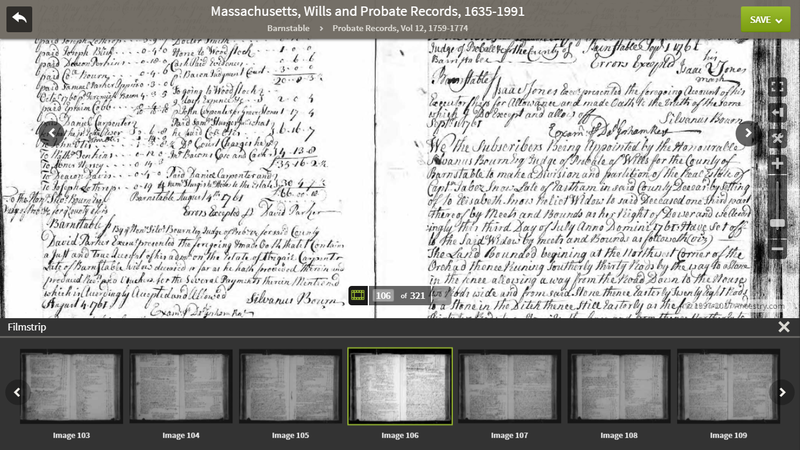 Genea-Musings: Dear Randy - You Really Should Check the Probate Record Indexes! Dear Randy - You Really Should Check the Probate Record Indexes! A note to myself! That was the message I re-learned yesterday...and hope to remember in the years ahead. Yep, I took a short cut and learned (re-learned?) a lesson. 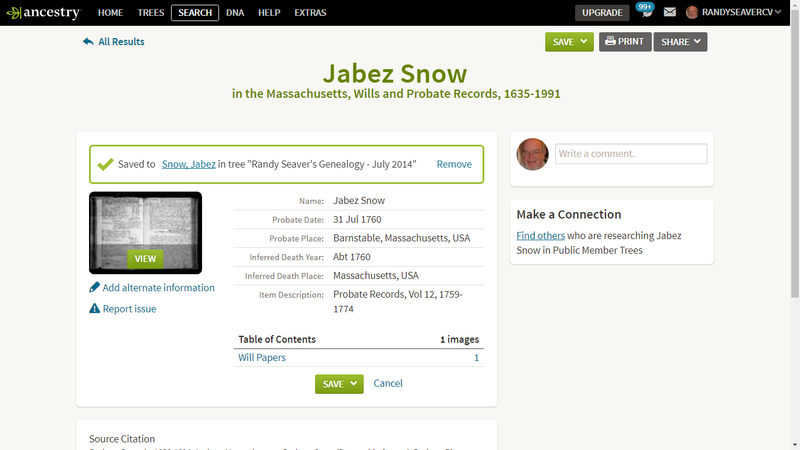 As you can see, Ancestry has indexed this page on the "digital microfilm" with the name "Jabez Snow" for image 92 of 321. The records for Jabez continue on to the next image on the "digital microfilm" labeled "Benjamin Higgins" (whose records start at the bottom of image 93). 2) These two pages contain the will, the letter testamentary and the inventory. Note that these are probate court clerk volumes - copied into record volumes by the court clerk from the original probate papers, which should be in a probate packet in the Probate Court records. 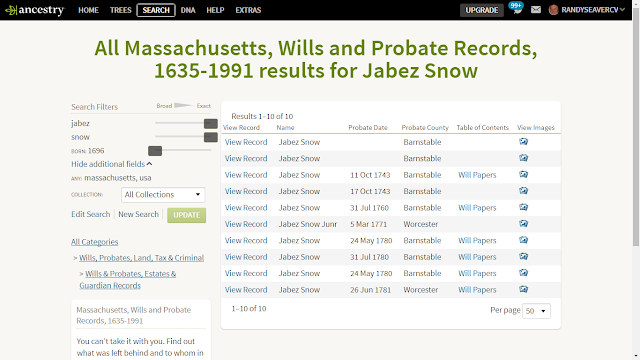 I captured those two images, created a source citation for them, put them in my family files for Jabez Snow, transcribed them, and wrote an Amanuensis Monday blog post for them - Amanuensis Monday - Post 319: Probate Records of Jabez Snow (1696-1760) of Eastham, Mass. 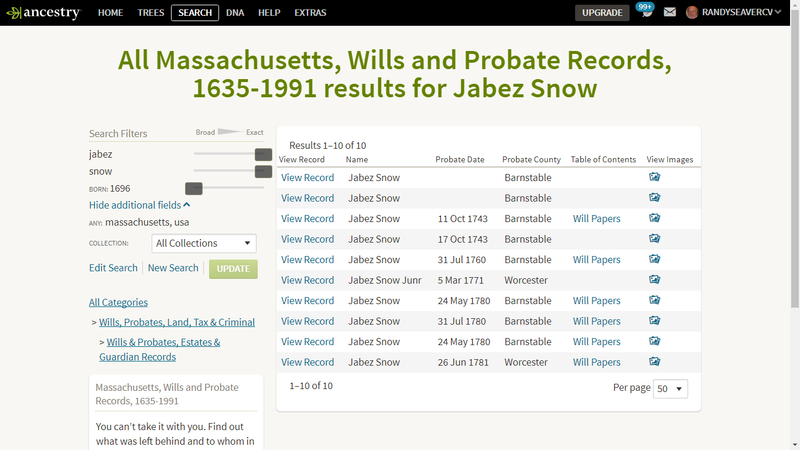 3) I wrote 52 Ancestors - Week 207: #286 Jabez Snow (1696-1760) of Eastham, Massachusetts last night, and it posted today. While I was writing the Notes, I realized that the probate records I had seemed incomplete - there was no widow's dower, no account, no distribution or other document that are typically in probate records. Maybe I should check the probate volume index to see if there are additional papers available. * Dividend of Dower - Account 17, page 59. Why weren't these Volume 12 records, and the Volume 17 records, indexed by Ancestry.com? When I looked at the filmstrip at the bottom of the image above from Volume 12, there are 14 images (28 pages!) indexed as "Thomas Hopkins." Only one or two of the images are for Thomas Hopkins - at least two images have my Jabez Snow, and at least four have records for Samuel Mayo, etc. The Volume 17 images were not indexed properly either. So, in this case, only 3 of the 9 records for this estate were indexed by Ancestry.com. 4) Some might ask "Why does it really matter? You found the will which named the wife and children and the inventory that listed his real and personal property - isn't that enough?" Well, no. 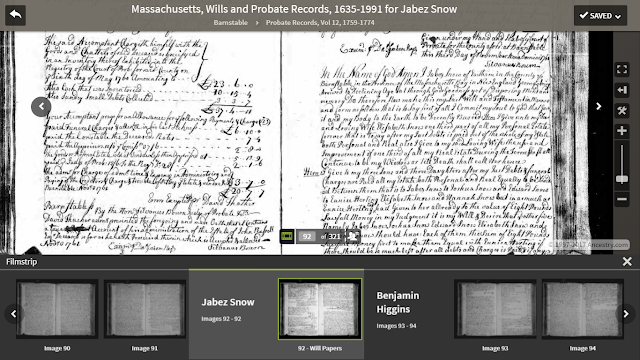 With the other records, I found that the widow's dower of one-third of the real estate was set off to her, that the estate was insolvent with the amount owed to the list of creditors greater than the value of the real and personal property, and that the executor had to sell the two-thirds of the property (Jabez Snow's portion) at auction, accounted for it, and was ordered to pay the creditors about 15 shillings to the pound. Then, after the widow Elizabeth Snow died in 1772, her one-third dower portion of the real estate was appraised and the administrator was ordered to sell the property at auction, account for it, and to pay the creditors about six shillings to the pound. So twelve years after Jabez died, the creditors that he owed money to had received about 95% of what they were owed. Did all of that affect the Jabez Snow family? None of the children received land or personal items from their parents, unless they paid for it themselves. The widow lived another 12 years, probably in relative poverty and with family members. The will and inventory imply that Jabez Snow was relatively wealthy, but the fact was he owed more money than he was worth. Did that affect the attitude and memories of his children and grandchildren toward him? We can find many of the records for most of our ancestors if we're lucky and good, and we rarely find the family stories, memories, biographies, or heirlooms of our ancestors. 5) Once again, the Ancestry.com indexing of the Wills and Probate Records collections has failed to guide this user to all of the records in their collection - only 3 out of 9. So, once again - I request that Ancestry.com comb through these records again, and completely and accurately index every record in them so that researchers can trust that the index will find all of the records pertaining to their ancestors. 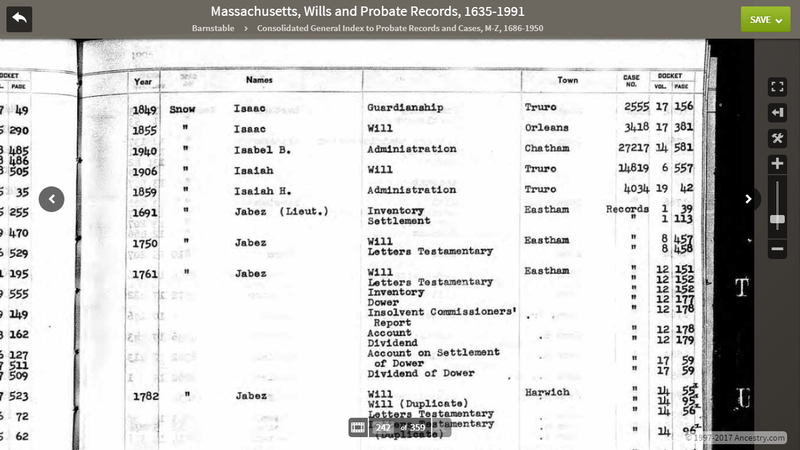 While they are at it, it would be a tremendous help if they indexed every person named in these probate records so researchers could easily find the heirs, the witnesses, the appraisers, etc.